When , (1.1) is called as usual Rosenau equation proposed by Rosenau  for treating the dynamics of dense discrete systems. Since then, the Cauchy problem of the Rosenau equation was investigated by Park . Many numerical schemes have been proposed, such as -conforming finite element method by Chung and Pani , discontinuous Galerkin method by Choo et al. , orthogonal cubic spline collocation method by Manickam , and finite difference method by Chung  and Omrani et al. . As for the generalized case, however, there are few studies on theoretical analysis and numerical methods. Hence, we propose two conservative difference schemes which simulate conservative law (1.4). The outline of the paper is as follows. In Section 2, a nonlinear difference scheme is proposed and corresponding convergence and stability of the scheme are proved. In Section 3, a linearized difference scheme is proposed and theoretical results are obtained. In Section 4, some numerical experiments are shown. 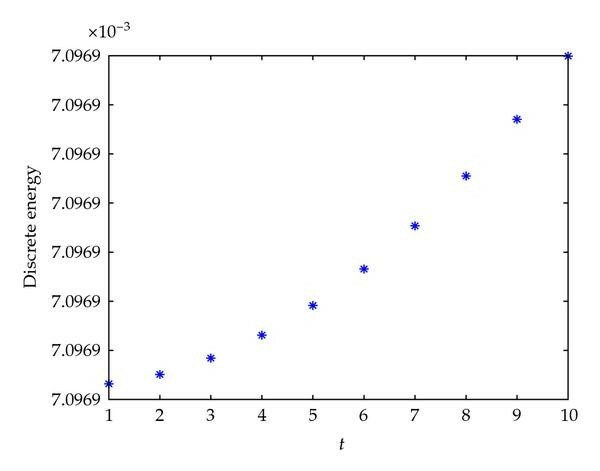 and in the paper, denotes a general positive constant which may have different values in different occurrences. By the definition of , (2.7) holds. To prove the existence of solution for scheme (2.2)–(2.4), the following Browder fixed point Theorem should be introduced. For the proof, see . Lemma 2.3 (Browder fixed point Theorem). Let be a finite dimensional inner product space. Suppose that is continuous and there exists an such that for all with . Then there exists such that and . There exists satisfying the difference scheme (2.2)–(2.4). By the mathematical induction, for , assume that satisfy (2.2)–(2.4). Next we prove that there exists satisfying (2.2)–(2.4). Obviously, for all , with . It follows from Lemma 2.3 that there exists which satisfies . Let , it can be proved that is the solution of the scheme (2.2)–(2.4). Using Taylor expansion, we know that holds if . Hence, . According to Sobolev inequality, we have . Lemma 2.6 (Discrete Sobolev's inequality ). 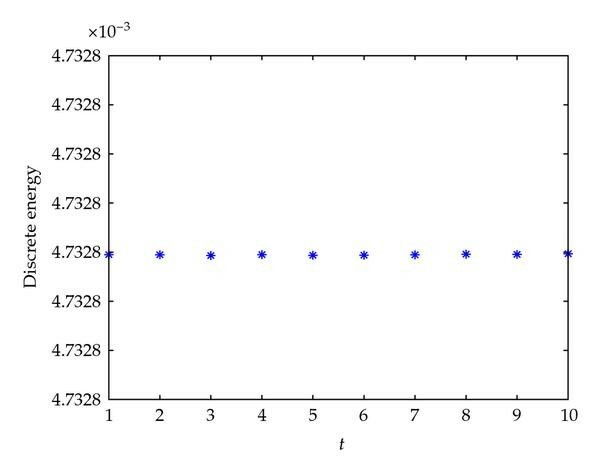 Lemma 2.7 (Discrete Gronwall inequality ). Suppose , then the solution of (2.2) satisfies , which yield . According to Lemma 2.6, we have . Suppose , then the solution of the scheme (2.2)–(2.4) converges to the solution of problem (1.1)–(1.3) and the rate of convergence is . This completes the proof of Theorem 2.9. Similarly, the following theorem can be proved. Under the conditions of Theorem 2.9, the solution of the scheme (2.2)–(2.4) is stable by . By the definition of , (3.2) holds. The difference scheme (3.1) is uniquely solvable. That is, there uniquely exists trivial solution satisfying (3.8). Hence, in (3.1) is uniquely solvable. Suppose , then the solution of (3.1) satisfies , which yield . Suppose , then the solution of the schemes (3.1), (2.3), and (2.4) converges to the solution of problem (1.1)–(1.3) and the rate of convergence is . This completes the proof of Theorem 3.4. Similarly, the following theorem can be proved that. Under the conditions of Theorem 3.4, the solution of the schemes (3.1), (2.3), and (2.4) are stable by . We construct two schemes to (4.1)–(4.3) as nonlinear scheme (2.2) and linearized scheme (3.1). Since we do not know the exact solution of (4.1)–(4.3), we consider the solution on mesh as reference solution and obtain the error estimates on mesh , respectively, for different choices of , where we take . To verify the stability of schemes, we take . The maximal errors are listed on Tables 1, 2, and 3. The errors estimates in the sense of , when and . We have shown in Theorems 2.2 and 3.1 that the numerical solutions of Scheme (2.2) and Scheme (3.1) satisfy the conservation of energy, respectively. In Figure 1, we give the values of for with fixed for Scheme (2.2). In Figure 2, the values of for Scheme (3.1) are presented. We can see that scheme (2.2) preserves the discrete energy better than scheme (3.1). Energy of scheme (2. 2) when and . Energy of scheme (3. 1) when and . From the numerical results, two finite difference schemes of this paper are efficient. This work was supported by the Youth Research Foundation of SWUST (no. 08zx3125).